Today I was humbled and honored to be among global vaccine experts and officials from all 26 African "meningitis belt" countries in Addis Ababa, Ethiopia to celebrate one of Africa's biggest public health achievements -- the introduction of a vaccine, MenAfriVac®. This vaccine was designed, developed and produced for use in Africa, and in five years of use has nearly eliminated meningitis A from the continent. Fearsome epidemics of meningitis had swept across countries in sub-Saharan Africa for a century, killing and disabling young people every year and they were becoming more frequent and widespread throughout Africa, placing a great burden on individuals, families and the health systems of meningitis belt countries. An outbreak of meningitis A in 1996 infected over 250,000 people and killed over 25,000 in just a few months. In response to a plea for help from African ministers of health sixteen years ago, African officials, PATH, the World Health Organization (WHO), the Serum Institute of India, the Bill & Melinda Gates Foundation, and dozens of other partners answered this call and formed the Meningitis Vaccine Project (MVP). 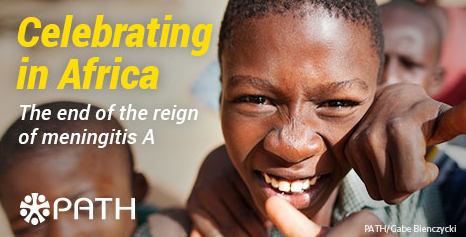 The mission was simple: to develop a vaccine to fight meningitis A in Africa. The introduction in 2010 of this new vaccine against meningitis A has resulted in one of the biggest immunization success stories in sub-Saharan Africa -- near elimination of a deadly infectious disease. As of mid-2015, the vaccination campaigns had reached more than 235 million people aged 1 through 29 years in 16 countries. The vaccine also helped to pioneer the efficiency and reach of mass immunization campaigns in remote areas of Africa, paving the way for other vaccines to follow. Now we are at a crucial moment -- coming together to celebrate the success of this partnership, share the lessons learned, and carefully plan for future use of the vaccine so that the meningitis A epidemics don't come roaring back. Countries now need to sustain the protection that initial mass vaccination campaigns provided by putting the vaccine into their routine immunization programs. This means everything from financing and procuring the vaccines to delivering the vaccines and monitoring coverage in communities. African leadership is the key to this success - it's only through these efforts that we can make this transition successfully and sustain protection against epidemic meningitis. After seeing the resolve of those around the table in Addis Ababa today, I am confident that meningitis A will soon be resigned to history books.